For the films titled Amateur, see Amateur (1994 film) and Amateur (2018 film). 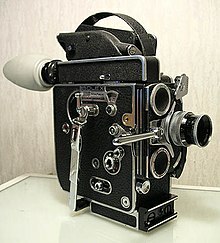 A Bolex H16. This 16mm film camera was a popular camera used by amateur filmmakers. Amateur film is the low-budget hobbyist art of film practised for passion and enjoyment and not for business purposes. The international organization for amateur film makers is UNICA (Union International du Cinema Non Professionel); in the United States the American Motion Picture Society (AMPS), in Canada the Society of Canadian Cine Amateurs (SCCA), in the UK it is the Institute of Amateur Cinematographers. These organizations arrange annual festivals and conventions. There are several amateur film festivals held annually in the United States, Canada, and Europe. Amateur films were usually shot on 16 mm film or on 8 mm film (either Double-8 or Super-8) until the advent of cheap video cameras or digital equipment. The advent of digital video and computer based editing programs greatly expanded the technical quality achievable by the amateur and low-budget filmmaker. Amateur video has become the choice for the low-budget filmmaker and has boomed into a very watched and even produced industry with the use of VHS and digital video camcorders. Ian Craven (ed.) Movies on Home Ground: Explorations in Amateur Cinema. Cambridge: Cambridge Scholars Publishing. Karen L. Ishizuka and Patricia Zimmerman (eds.) (2008) Mining the Home Movies: Excavations in Histories and Memories. Berkeley: University of California Press. Heather Norris Nicholson (2012) Amateur Film: Meaning and Practice, 1927-77. Manchester: Manchester University Press. Ryan Shand and Ian Craven (eds.) (2013) Small Gauge Storytelling: Discovering the Amateur Fiction Film. Edinburgh University Press. ^ Movies on home ground : explorations in amateur cinema. Craven, Ian,. Newcastle. ISBN 9781443841696. OCLC 850163333. ^ Mining the Home Movie : Excavations in Histories and Memories. Ishizuka, Karen L., Zimmermann, Patricia Rodden. Berkeley: University of California Press. 2007. ISBN 9780520939684. OCLC 723943549. ^ 1957-, Nicholson, Heather Norris, (2012). Amateur film : meaning and practice, 1927-1977. Manchester: Manchester University Press. ISBN 9780719077739. OCLC 799144752. ^ Small-gauge storytelling : discovering the amateur fiction film. Shand, Ryan,, Craven, Ian,. Edinburgh. ISBN 9780748656356. OCLC 903489120.